Building products distributor ABC Supply Co. Inc., Beloit, WI, has opened a branch in Gloucester, VA, giving the the company 25 locations throughout the state. Logan Nonnemacker will manage the branch, the company said. Nonnemacker worked for Norandex as an outside sales representative before ABC Supply acquired the company in 2015. He then moved to ABC Supply’s Norfolk, VA, branch to continue working in outside sales. Please do not reprint MDM’s content on your website without MDM’s express permission as it is copyrighted material. To gain permission, email us, or call 1-888-742-5060. For information on PDF or print reprints, visit www.mdm.com/reprints. 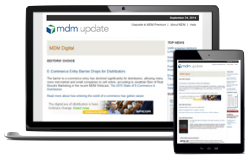 MDM welcomes inbound links from your site. Please cite Modern Distribution Management.